I am so excited to show you guys some of the illustrations for my book! 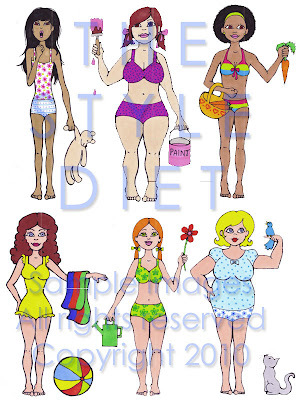 These are my six girls that represent each body shape. Let's see if you can guess which ones are which! I think they are so adorable and their little props are CUTE! My illustrator sent these to me just last week so I am thrilled to finally have my own images of shapes to use and refer back to. These illustrations are no longer being used for my book. You can click here to find out which ones are! I like these. They havevariance. and apple, right arent i! I don't about the taste of others, but I just love them so much. I don't care wat other people wrote about them, I love them!! They are SO cute! I think these illustrations are cute, Anna! I think some of the adults responding to this are a little "out of touch" with teens these days! I'm a school teacher, grade 9, most of my girls are between the ages of 14-16 and they would absolutely love the images you've created. One would be surprised to see how "child like" imagery gains the attention of adolescents better that almost any other tactic! Seriously...students do extra work just to earn stickers! Go with the images! They'll be a major success! Good luck with your publication! LOL The one on the top left looks JUST LIKE ChanelBlueSatin on YouTube!! Except for the fact that I've never seen Cynthia have that kind of expression on her face. You two are my favorite people on Youtube!! I think the images are great. There is a kitschy flavor to them. It's blatantly cute and it works. These are very good...simple, cute and easy to understand for teens!!! Hope your book goes well! If you planned on reaching an older audience I would suggest taking a look at the illustrations in Nina Garcia's 100. After reading these comments i searched in your blog for the winner of this contest and i got a little hope because of the different comments. So i hope you didn't made your decission yet. Can you still be a hourglass shape with a 32" bust, 24" waist, and a 32" hip?? What tips do I follow, that ones for boyish shape (because my bust and hip are so small) or hourglass (because my waist is 8" smaller than both my bust and hip)???? HELP!! !